As you may have heard, as of July 2012 Japan will be getting rid of the current Alien Registration System, including the onerous Alien Registration Card and re-entry permit system. In addition to the convenience of not having to shell out for a re-entry sticker on your passport, there is another benefit to the new system. Foreign residents will finally be able to join their Japanese brethren on the Basic Resident Registry (jumin kihon daicho 住民基本台帳). Japan uses two distinct systems of registries to keep tabs on the population. The first is the aforementioned Basic Resident Registry and the second is the Family Registry (koseki 戸籍). The former is a listing of your basic information (name, DOB, etc. ), address, immediate family, insurance and pension info, and your registered alias (tsusho 通称, usually the katakana spelling of your name). It also determines your legal "head of household" (seitai nushi 世帯主), which is important for tax and legal purposes. The later is a registry of family relationships, including births, deaths, children, adoptions, marriages, and so on. The Family Registry is one of the oldest legal systems in Japan. The Family Registry serves the purpose of birth, death, and marriage certificates found in Anglo-Saxon countires as well as serving as proof of Japanese citizenship. Therefore, foriegners cannot be entered into a koseki. Both the Resident Registry and the Family Registry are kept by your local town, city, or ward. If you move to a different locality, you must report it to your new and former municiple offices so they can make arrangements to transfer your records. Until this year, foreigners were not permitted to enter their names into a town's resident registry. 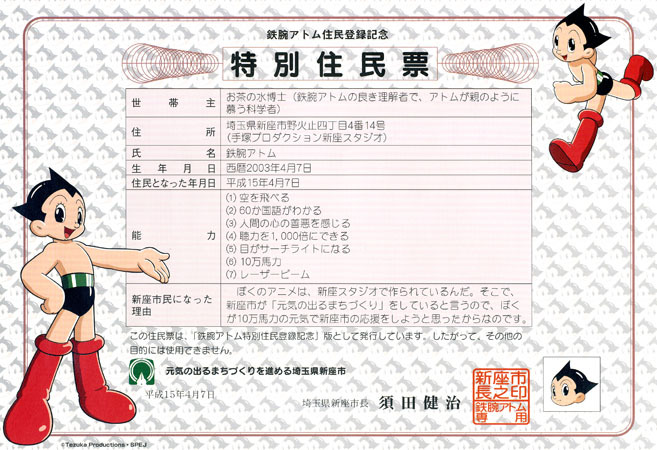 Instead of creating a jumin-hyo (a resident registry file 住民票), foreigners were granted a Certificate of Registered Matters (gaikokujin toroku genpyo kisai jiko shomeisho 外国人原票記載事項証明書) and listed in the municipality's Alien Registration (gaikokujin toroku 外国人登録) file. This system caused some headaches, especially for anyone married to a Japanese citizen. Before the revised Alien Registration Law, foreigners were not permitted to be listed on the register with their spouse and offspring. Also, the Japanese spouse would always be listed as the legal "head of household" regardless if they wanted that legal responsibility or not. Some municipalities allowed for special remarks (biko 備考) placed at the end of the registry noting that the foreigner is listed in a separate file and is the de facto head of house hold (jijitsu-jo no setai-nushi 事実上の世帯主). Since the jumin-hyo is used to provided a variety of public services as well as legal proof for entering school, applying for goverment permits, paying taxes and so on, allowing foreigners to participate in this system made sound legal and logistical sense. The first step in converting your Alien Registration to a proper Address Registry involves the creation of a Provisional Resident Registry (kari-jumin-hyo 仮住民票) by your local town, city, village, or ward. Around the time the of this article's posting you should be recieving a copy of your Provision Resident Registry in the mail. There should be fairly through English instructions included with the packet, but basically all you need to do is check to make sure that your name, nationality, resident number (zairyu bango 在留番号, the same number that appears on your Alien Registration Card), insurance and pension info, and so on are all filled out correctly and send it back to the appropriate office. If there is a problem, consult the citzen division of your village, ward, town or city (sonmin-ka 村民課 kumin-ka 区民課 chomin-kan 町民課 shiminka 市民課 respectively). A full registry will be officially made after the revised Alien Registration Law takes effect in July. For those of you arriving in Japan with a mid-to-long term visa, then you need not worry about the above step as your municipality will automatically make a Resident Registry when your move into a new address. The obvious benefit of this new system is that it will be easier for foreigners to access public services and non-Japanese spouses will have a single registry. However, there are some other subtle benefits. About a year after the law's implementation, non-Japanese residents will be allowed to join the juki-net (住基ネット) electronic registration system used by most towns and prefectures. This is essentially a giant electronic jumin-hyo used by almost all municipalities in Japan. Not only does it simplify moving-in and moving-out procedures, but it also allows for you to get a Basic Resident Registry Card (jumin kihon daicho kaado 住民基本台帳カード) which is necessary for filing e-taxes (if you are self-employed) and claiming the e-filing deduction. This article is great. Thanks for sharing.